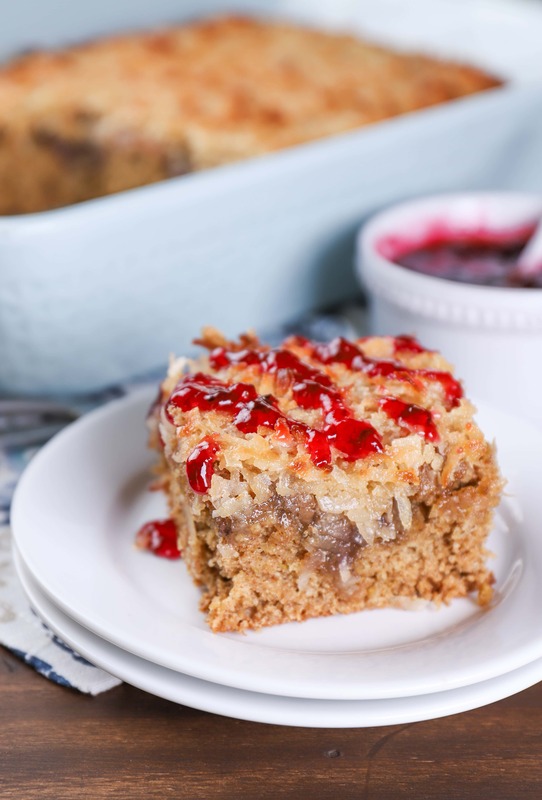 Tender and moist, this Caramel Broiled Berry Oatmeal Cake is swirled with berry preserves and topped with an irresistible toasted coconut caramel topping! *Recipe from 05/09/12. Updated 05/16/18. I was recently looking through an old cookbook for inspiration. I love seeing what the popular recipes were during certain decades. 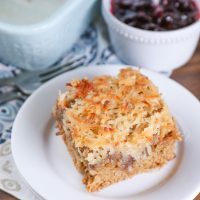 And while a lot of the recipes in this particular cookbook had a heavy emphasis on shortening and cream soups, this oatmeal cake intrigued me. 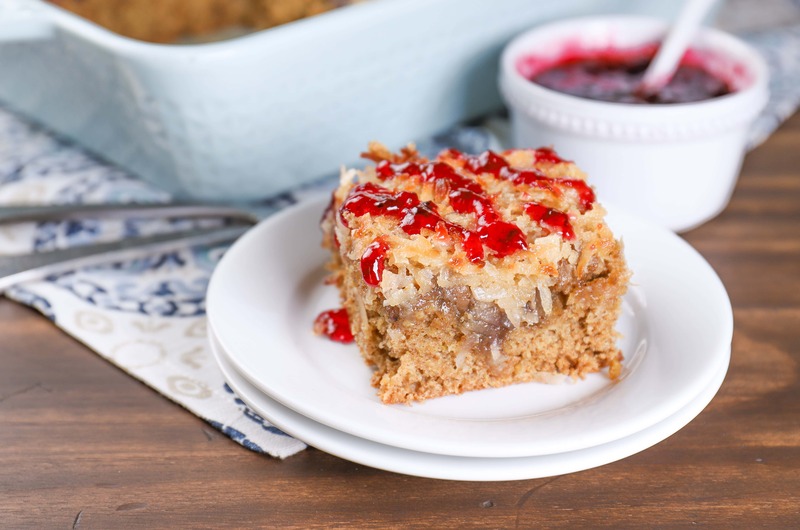 An entire cup of oats in a cake. 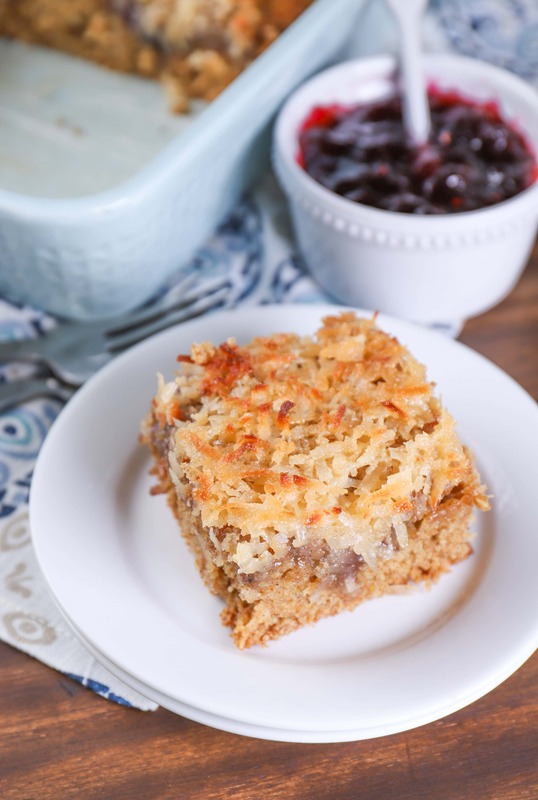 Plus, a coconut broiled topping that sounded too good to be true. I obviously had to try it. With a few healthier substitutions to cut back on the crazy amount of sugar and oil that were originally called for! I was a little nervous that the cake would be heavy, dense, and dry with all of the oats that are in it. However, it ended up being tender. And while it was heavier than your typical dessert cake, it still had the texture of a coffee cake and is far from being dry. 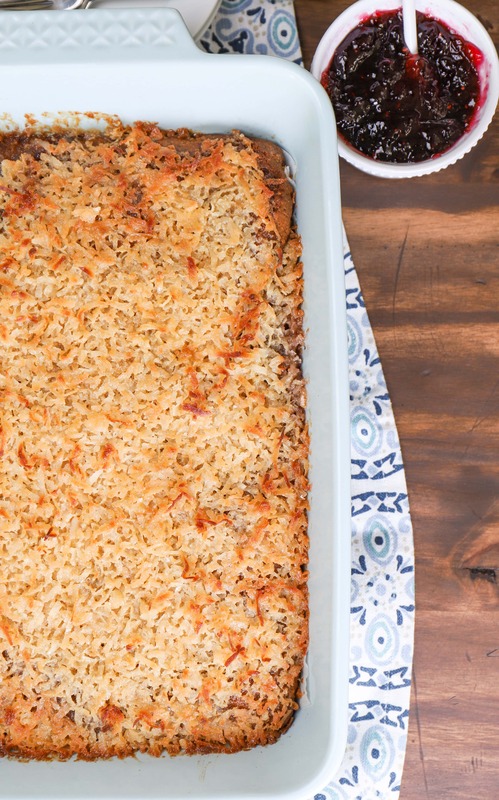 The sweetness of the preserves and coconut pairs well with the nuttiness from the oats. You can use your favorite homemade or store bought preserves. I couldn’t decide what flavor to go with, so I used a blueberry, strawberry, raspberry preserves that’s a combination of some of our favorite berries! The topping isn’t your typical frosting or glaze. You combine coconut, butter, brown sugar, and half & half (so, not your healthiest ingredients!). Then you spread the mixture over the top of the cake at the end of the bake time. It will seem like there isn’t enough of the topping when you’re spreading it over the cake, but it will spread as it broils and give you a good covering. The result is a gooey, caramel-y layer that’s rich, sweet and irresistible! 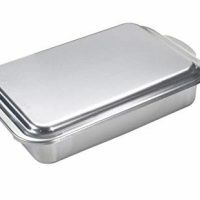 Preheat oven to 350 degrees F. Spray a 9×13 baking dish with non-stick cooking spray. 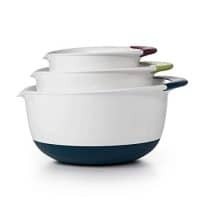 In a small, heat-safe bowl, stir together the boiling water and oats. Set aside. In the bowl of a stand mixer, combine sugar, brown sugar and butter. Beat on medium speed until well-mixed, scraping sides occasionally. Beat in eggs and yogurt until creamy. Add flours, cinnamon, baking soda, salt, and vanilla. Beat until combined. Reduce speed to low and add in the oat mixture. Beat until blended. Spread batter into prepared pan. Drop preserves by teaspoon-fulls on top of batter. Swirl the preserves through the batter with a knife. Bake for 25-30 minutes or until knife inserted in the center of the cake comes out clean. Remove from oven. Turn oven to broil. Combine all ingredients for the topping in a medium-sized bowl. Carefully spread over hot cake. Return to oven and broil (4-5 inches from heat) until bubbly and browned. This should take about 2-8 minutes, depending on the broil setting of your oven. Watch closely to prevent burning. This recipe is inspired by Land O’ Lakes. I did see something like this the other day, however, it did not have the swirl of the preserves which I consider to be an excellent addition! With the exception of the topping, this cake does not have any butter in it, which is an extra bonus. Glad you shared this one-yum! Thanks! I love how moist it is without being full of fat! Mouth-watering! This cake looks amazing, Jessica! YUM!!! What I wouldn’t give for one (or three!) of these right now! Oh my gosh, that looks so good. Gooey kind of good. I’m the mom of the house so I’ll have to make the treat for myself, but it looks to be well worth it! Thanks! It’s really easy to make! You can broil in caramel? Why did I not know this?! This looks to DIE for! The topping is amazing! I am definitely going to try broiling more often! Wow! This cake looks delicious and oh so moist. I’ve never heard of an oatmeal cake. I’m going to have to try this recipe. I hadn’t heard of it until just recently and I knew I had to make a version of it!